"All in all, an outstanding recording and another triumph for Jaroussky." Sometimes I can almost understand why the Earlv Music movement still attracts scepticism bordering on hostility from mainstream music lovers. Seemingly, each month sees the release of new CDs of Baroque opera arias sung by countertenors who can certainly sing high and fast but with voices so ugly that, had they been female singers, they would surely have been laughed out of the studio. No wonder some think that the movement values gimmickry over artistry. That said, there are also many countertenors blessed with lovely voices and who sing with immaculate control and great sensitivity. Among others, the names of Alex Potter, Franz Vitzthum, Terry Wey, David Erler, Paulin Bündgen and Doron Schleifer come to mine ‑ all of them serious, thoughtful singers, not marketing‑driven show‑ponies.But most of them tend to sing more sacred or chamber music than opera, as well as exploring the pre‑Baroque repertory. 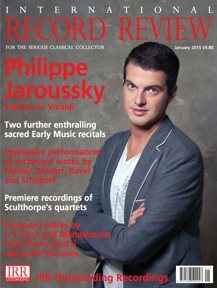 The one outstanding exception to this unfortunate bifurcation is Philippe Jaroussky. He is equally proficient in opera, sacred and ensemble music and, for once, fully deserves the critical and popular acclaim he receives. In this respect, he is fully the heir of Andreas Scholl. far away. 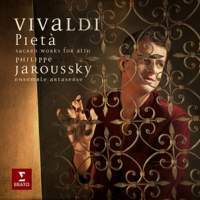 But, suggested by his entitling the disc 'Pieta', Jaroussky recognizes that these are still essentially religious compositions, where reverence and virtuosity are complementary. With the exception of the Nisi Dominus, which he has already recorded elsewhere, this disc effectively contains all the well‑known sacred works for alto voice and orchestra. As the singer notes in a personal preface to the recording, the disc follows his two earlier releases of Vivaldi's opera arias and cantatas and after numerous recordings devoted to less well known figures ... I felt a need that was as much physical as musical to return to this great composer'. As if in subtle rebuke to the current crop of high‑octane countertenors with their strident voices and unremitting vibrato, Jaroussky's singing on this disc is silkier than ever. His voice has a shimmering brilliance in fast passagework such as the third verse of Clarae stellae, scintillate and the opening of Longe mala and honeyed softness in tender passages such as the 'Domine Deus (where discreet vibrato is applied) and the sinuous middle movement of Filiae maestae (where it is largely absent). His diction is, as ever, utterly clear and his subtle shading of phrases reveals profound engagement with both music and text. These qualities contribute to a mesmerizing performance of the great Stabat mater, which has been a countertenor staple since the pioneering recording by James Bowman and the recently formed Academy of Ancient Music. Speaking of which, I remember a critic pouncing on the fact that a man was singing music written for a woman, with a message of 'so much for your authenticity!'. In fact, as Delaméa points out, the Stabat mater was written not for the girls and women of the Ospedale della Pietà but for the Oratorian community in Brescia and was probably first sung by the celebrated countertenor Filippo Sandri. It seems to have been Vivaldi's first sacred composition. Jaroussky's sublime singing is well matched by Ensemble Artaserse ‑ a full‑sized orchestra (by Baroque standards) which he himself conducts. Its playing is suave and sympathetic, matching the singer's every inflection perfectly. Among the musicians, especial praise goes to oboist Emmanuel Laporte, who shines in 'Domine Deus', and theorbist Claire Antonini for outstanding continuo playing throughout. All the musicians benefit from a warmly atmospheric recording made in the church of Notre‑Dame du Liban in Paris. All in all, an outstanding recording and another triumph for Jaroussky.